Do you remember my Winter Clothes Pre-Primer Sight Word Match? 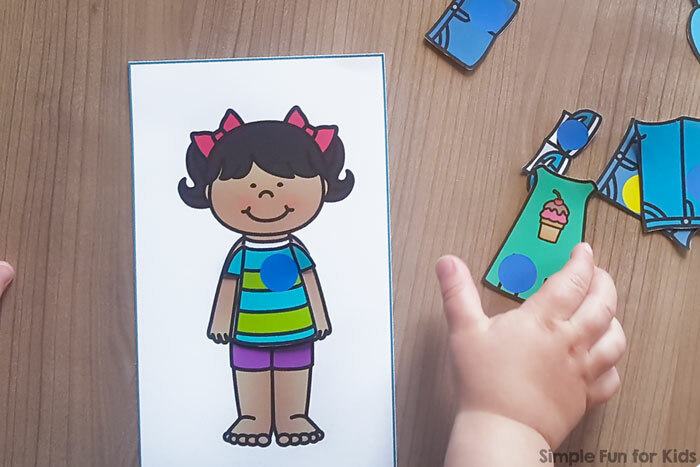 6-year-old E loved it to practice her sight words, but I didn’t expect 2-year-old N to enjoy dressing up the paper dolls just for fun as much as he did. 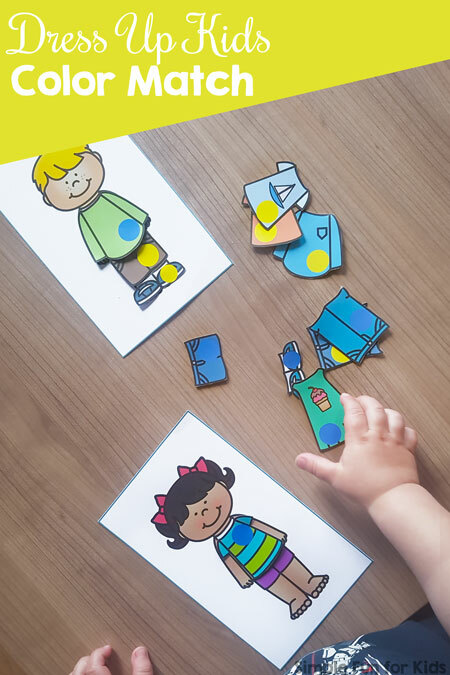 So I made him this printable Dress Up Kids Color Match activity. He was so excited when he saw it and had a blast putting the outfits together again and again <3 He didn’t always decide to stick to actually matching the colors, but it definitely gave us a chance to talk about the different colors and just have fun with it. The file includes 4 different kids (2 boys, 2 girls) with a dot on the chest in blue, yellow, red, and green respectively. With each kid come six different items of clothing that each have a dot in the same colors. Each color has different clothing options including dresses, long pants, shorts, t-shirts, and long-sleeved shirts. Print as many pages as you want (each page has one kid and clothes with the same color dot) and cut out the clothing items at the black lines. You can cut out the paper dolls at the black lines as well or cut along the turquoise lines around the image and keep the white area around it. Then mix up the clothing items and let the kids dress up the paper dolls. Download your Dress Up Kids Color Match Printable! Are you looking for other color sorting activities? I’ve picked out a few you’ll like! Hi Jackie, thank you so much for the kind words! They really mean a lot.